Since the end of October Erdogen's fascist/Islamist regime in Turkey hs again been shelling and bombing northern Syria. One of these bombings killed a small child on her way to school. 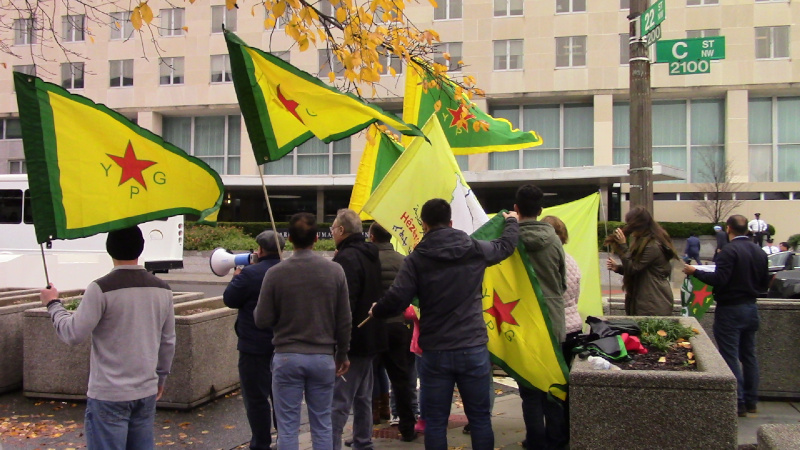 On the 5th of November, Kurdish activists and their supporters showed up at the US Department of State. US action to end the attacks could be as simple as an ultimatum to Turkey to stop the bombing or face a US arms embargo. Protesters called Turkeys's Islamist (theocrat) dictator Erdogen a baby-killer for the proven cases of his shells and bombs killing children in northern Syria. Protesters also emphasized the role of the Kurdish YPG and YPJ fighters in turning the tide against ISIS(Daesh), and skewered Erdogen for effectively supporting ISIS by attacking Kurds. Had it not been for the YPG and YPJ, ISIS would probably now control half of Syria and potentially might have taken all of the Sunni portions of both Syria and Iraq and held them indefinately. The choice of the Dept of State as the site of the protest was meant to demand that the US put a decisive stop to aggression against northern Syria and the Kurdish people by Turkey. Some of the activists wanted to either deliver a note to or meet with the State Dept's Syria desk, but those negotiations went nowhere. Erdogen's regime could not survive an end to the sale of US weapons to the Turkish military, and probably would also fall if NATO decided to expel Turkey for their crimes in Kurdistan and elsewhere in northern Syria.